In today’s world many of us spend huge amounts of time hunched over a desk, and sitting in the car. A large percentage of you reading this probably spend 40-60 hours per week sitting. Couple this with limited physical activity and you are looking at a very sedentary, inactive week. Not ideal for a body that was designed to move. The same person whose body is getting accustomed to disuse, and adapting appropriately, then expects to make high quality golf swings minutes after rolling out of bed at 7am on a Saturday morning. Not very realistic. Our bodies are very good at adapting to the stresses we subject it to . When we spend hour upon hour, year after year, slouching over a desk, undesirable changes in many of our physical qualities can begin to sneak in. This is especially true in people that aren’t proactive in their approach to maintaining their bodies. Simple choices in regards to maintaining/improving your physical qualities that become habits may seem small,but are powerful in the long term. The mesmerising golf swings of the pros you watch on TV require mobility in movements that desk bound players often struggle with. 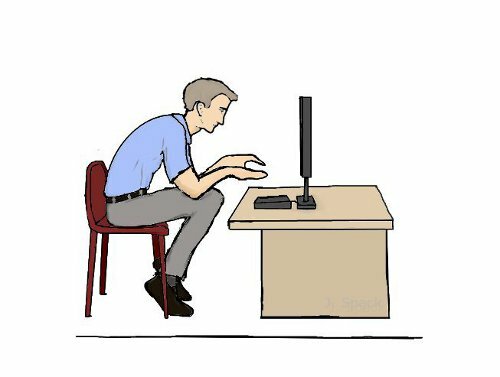 The hips, thoracic spine / mid back, and shoulders, are of critical importance and often the places that decline the most in the desk bound. I see the same patterns everyday. Not many people sitting for 60 hours a week are achieving this position….or close to it. Try 2-3 circuits of 8 reps on each exercise. Let me know how it goes. These are just the tip of the iceberg, if you are serious about transforming your golfing body for longer drives, less aches, more energy, and just want to be healthier and in better shape in general check out the Fit For Golf 12 Week Online Programs. For a limited time, you can avail of 50% off by entering FFG50 in the coupon bar at checkout. Would you like to receive a FREE golf specific mobility routine? Just enter your name and e-mail address below. You will also get regular golf fitness tips, and exclusive discount codes.